My kinder students know who Ms. Y. 's favorite artist is. "Mary Blair!" they all shout when I say that I'd like to tell them about an artist that I like. She was an artist who's most famously known for designing the Disneyland ride It's a Small World. Mary also worked on the color styling and background art for my favorite Disney film, Alice in Wonderland as well as Dumbo, Peter Pan, and Three Caballeros. Her husband also worked for Disney, and as the story goes, she felt extremely frustrated as the only woman working in a high capacity role, getting turned down for her amazing ideas. She was unhappy with the work environment, so she quit her job to work on her own in advertising. One of my favorite new books, and one that my kindergarten students enjoyed, is Pocket Full of Colors by Amy Gugielmo, Jacqueline Tourville, illustrations by Brigette Barrager. Our project was inspired by Mary Blair and It's a Small World, using squares to build shapes and discover fun color combinations. It can be as free or as structured as you need it to be. 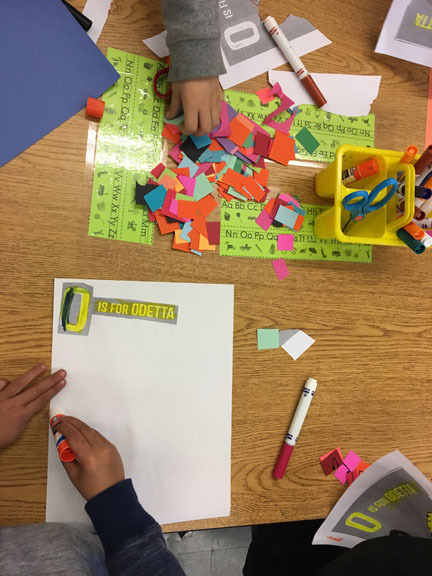 Older students can create buildings, younger students can experiment with color combinations, and there's potential for all grades to turn this into a collaborative piece if you hang them next to each other. Add another layer by giving them markers to draw doors, windows, and other details. Some students made comments about Minecraft, naturally. 1" Pre-cut squares in various bright colors: "Smalls"
2" Pre-cut squares in various bright colors: "Bigs"
Glue two "smalls" onto one "big" on alternating corners. This creates a checkerboard. Create several of these squares, with different color combinations. When you have a nice stack of checkerboards, arrange them onto a large piece of construction paper and glue down. After everything is glued, draw details, if desired. Students can also glue some smalls directly onto the large paper to fill up space, create steps, bridges, etc. Note: I used the paper cutter in the teacher's workroom to cut down the bigs and smalls. You know the one- squeaky arm, a little wobbly, not exactly sharp or straight, and you have to rest the blade on your shoulder when readying the paper to cut. I can see that they're not exactly square, but that didn't bother me or my students too much; however, it could bother certain students or teachers. Use whatever resources you have in your school to make the squares that are right for you. As a kid, I loved the book Miss Nelson is Missing by Harry Allard + James Marshall. As a substitute teacher, I loved it even more! So when I was asked to sub on "Dress Up As Your Favorite Character In A Book" Day, who else would I be?! 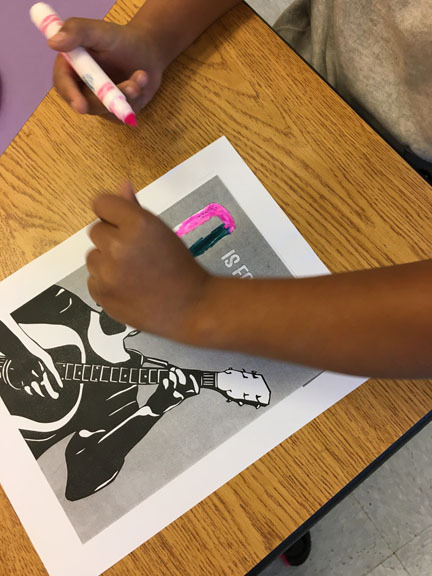 As an art teacher, and a fan of this book, I was thrilled to see that the students in this classroom already had read the book and made colored paper collages of that mean ol' Miss Viola Swamp! ...I'm gonna let it shine. Let it shine. Let it shine. Let it shine. We listened and sang along to Odetta Holmes' soulful song as we celebrated Black History Month. The book Rad Women A to Z has again brought us stories about strong Black Women who have influenced so many. We celebrated her beautiful voice and the music that she brought to the world by drawing music notes in a fun collage using the amazing illustrations by Miriam Kelin Stahl as a focal point. Color the photocopy and cut out the letters and image. Glue them onto construction paper along with the squares. Draw music notes on the squares to finish.